Birjia, a lesser known language is spoken across the states of Jharkhand, Bihar and West Bengal. 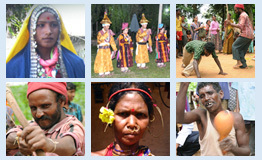 In Jharkhand the Birjia community inhabits in the districts of Lohardaga, Gumla, Ranchi and Palamau. Birjia people are found in some parts of Bihar and in some districts of West Bengal like Darjeeling, Jalpaiguri, 24 Parganas, Malda and Nadia. According to the 2001 Census report Birjia population strength in India is 12,784. The speech of the Birjia community is commonly assumed to belong to the Munda group of the Austro-Asiatic family of languages. Its speakers’ strength is less than 10,000 and it is considered to be one of the endangered languages in India. The dominant languages of the Birjia-speaking areas are Hindi, Sadri and Panchparganiya in Jharkhand; Bengali, Hindi, Mundari, Santhali etc in Bihar and Bangla. Hindi, Santhali, Bodo etc in West Bengal. The language has no script. Birjias use the script of the respective dominant languages of the region.There are some books providing information regarding the culture and social organization of the Birjias, but no linguistic work or ducumentation has so far been done. Birjias were initially nature worshippers. They used to worship earth, sun, moon, forest etc. Later they started to remember ancestors also. However, in course of time many of them have adopted other religions like Vaishnavism, Christianity and rarely Islam. Irrespective of this change many Birjias worship Hindu gods like Shiva, Lakshmi, Durga, Vajrangvali (Hanuman) and others. They are secular in spirit. At the time of their Karam and Sarhul festivals all communities belonging to different religions assemble and participate in the festivals without any religious bias. They are still dependent upon the natural resources of the forest. Nowadays, Birjias follow agriculture as their occupation especially the ones who have moved to the plain lands. They have some small land holding on which they practice plough cultivation. Some sections of the tribe who live in the hills are hunters and gatherers. Along with agriculture, some Birjias breed pigs goats, hens etc. They used to inhabit in the deeper and denser forest areas. Presently, they are more or less settled in villages and have given up the practice of shifting cultivation. At present in order to protect, preserve and document the Birjia language attempts have been made to prepare a grammatical sketch, a trilingual dictionary (Birjia-Hindi-English ditionary) and a socio-lingistic profile of the Birjia community. The work is in progress.